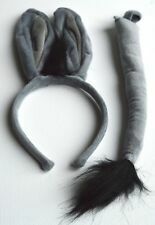 Adult Rabbit Kit, Grey, with Headband & Tail. “Its Great, its British, its Smiffys”. Safety: At RH Smith we take our responsibility as a supplier of family products very seriously and are continuously looking at ways to enhance our already high standards of safety and quality. Spots are so in! Our Leopard Accessory Kit includes leopard print accessories with pink bow accents. One size mask, choker and glovelettes fit most children. Leopard Accessory Kit includes Party Supplies. Cute Zebra Ears with Tail On an Aliceband. HEADBAND & TAIL. FOX INSTANT DRESS UP SET. LONG DARK BROWN FLOPPY DOG EARS ON HEADBAND. GREAT FOR BOOK WEEK OR SIMPLE FINISHING TOUCH TO YOUR OUTFIT. “Its Great, its British, its Smiffys”. Adult Tiger Kit, Black & Orange, with Headband & Tail. Safety: At RH Smith we take our responsibility as a supplier of family products very seriously and are continuously looking at ways to enhance our already high standards of safety and quality. Multi coloured Pony Fancy Dress White Pink Headband And multi Coloured Tail, fancy dress. Great for playing dress up, this accessory kit will allow you to transform instantly into your favourite cute animal! Bunny rabbit character. Bunny Accessory Kit. Includes: Ears, Nose and Tail. 1 x Pair of Ears. 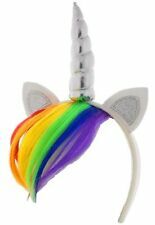 These horse alicebands and tails are great for a farm fancy dress party. The horse ears are made of soft fluffy material and feature a cute forward hair piece. The aliceband is adjustable to fit all head sizes, with the horse tail including an elastic strap to attach to your rear! 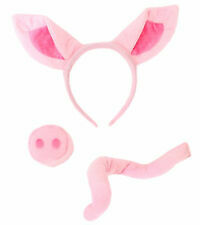 Each Kit Includes:- 1 x headband, 1 x tail. Really Cute Frog Eyes Headband Green. ideal for party's, dress up, plays. 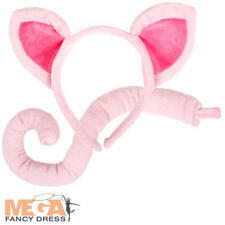 Cat ears headband. Fancy Dress. Pin-on cat tail. Party Supplies. WARNING: CHOKING HAZARD - Small parts. Not for children under 3 years. A very cute wolf ears ,lovely fluffy ears. One size fits all average heads.Growl at your friends or nativity or hen party nights out.A great quality item. Dress up the cutest bunny in town with our Bunny Kit for kids! This affordable Bunny Accessory Kit features a white plastic headband with attached white bunny ears with pink satin inserts and a fluffy white bunny tail that attaches with an elastic loop. Donkey Ears Alice band and Tail Set. Colour: Grey and Black. 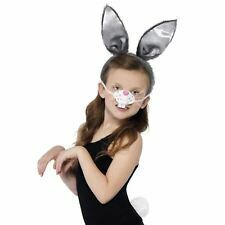 Adult Rabbit Kit, Black, with Headband & Tail. “Its Great, its British, its Smiffys”. Safety: At RH Smith we take our responsibility as a supplier of family products very seriously and are continuously looking at ways to enhance our already high standards of safety and quality. Wolf Ears Headband. These ears are made in a synthetic grey fur with white fur inside the ear. Really Cute Monkey Ears Headband. Soft thin latex rubber ear covers, reusable and comfortable. For a larger fit simply cut using a sharp pair of scissors copying the attached image. 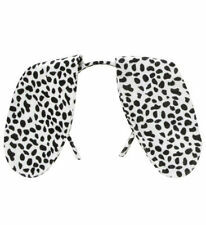 Soft animal print ears on a headband. Tiger Print Ears. Ideal for a quick fancy dress outfit ! Foxy Fancy Dress LTD. This does not affect your statutory rights. Fancy dress cat ears and paws - worn only once. For adults or kids.